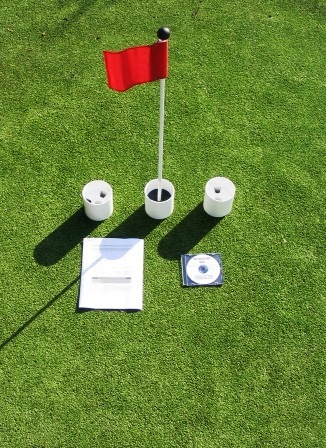 Putting Green Cups & Covers, Flags, Markers, Instructions & More. (1) Easy Grip 1" Round Handle/Knob. 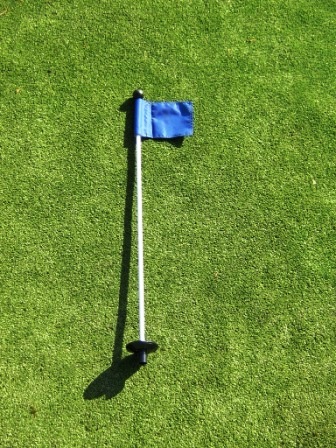 Additional & Replacement Color Flags (Red, Blue, White, or Yellow) & 33" Markers, are available below in "RELATED PRODUCTS"
Green Par Aide EPG (Executive Putting Green) Markers are also available in place of the 33" Marker poles with colored flag. Click on "Color of Marker Flag" above to view all the options and photos! (1) Step by step written installation instructions (with photos) of a synthetic putting green (both Nylon & Polypropylene), Cup installation, Seaming details, Bunker construction & more!. Note: Do to the detail of our written instructions, we have discontinued the DVD overview Add-in. Our covers will flush fit any PGA, USGA, or other Standard Regulation Golf Cup that is either 4" or 6" in depth and makes the green area more versatile by eliminating the hazards of an open cup. No more injuries from someone stepping into a hole and twisting an ankle. Now you can safely use your putting green area for other events requiring space at your facility or backyard. Covers also keep out leaves, rain & snow keeping your cups clean and ready for use. From Kurt Lyn of Houston, Texas on 10/31/2016 . From Mario Santa Ana of México DF, Mexico on 7/21/2016 . From Bill DeLany of Sedro Woolley, Washington on 4/23/2012 . 5/19/2011 – I WOULD LIKE TO PURCHASE THE PUTTING GREEN KIT. HOWEVER, CAN I PURCHASE AN EXTRA 3 CUPS ALONG WITH FLAGS? 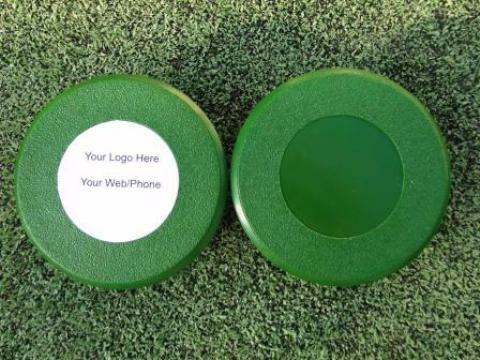 Customizable Flush Mount Golf Hole Cup Covers for all PGA & USGA Regulation 4" & 6" Deep Cups – Make your green safe for children & keep your cups clean & dry!